CALGARY — Five wins in a row? You’ve officially entered dynasty territory. 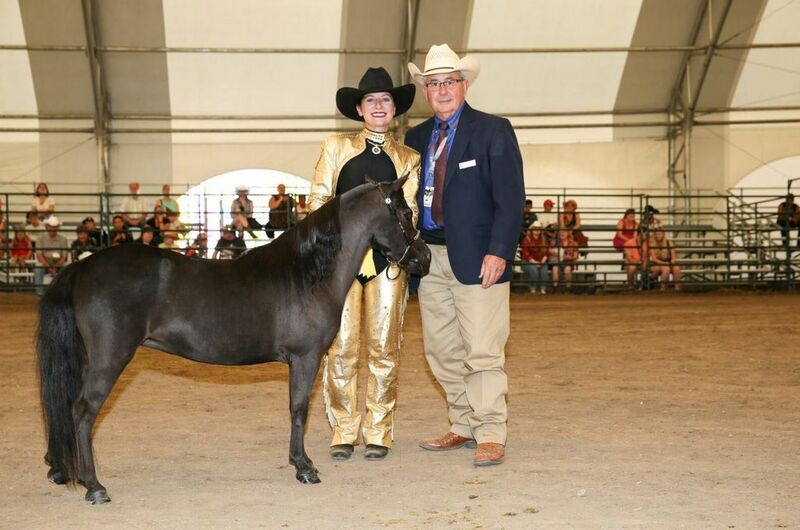 And that’s where First Knight Striders Black Satin firmly planted her hooves on Sunday afternoon when she was crowned Canadian National Supreme Halter Champion once again. 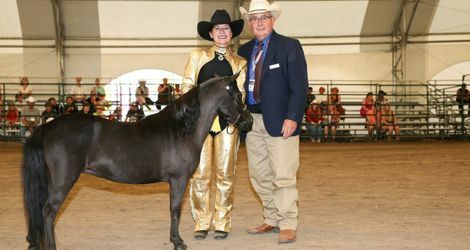 The seven-year-old mare, owned by Holly Whyte and Bill Clark of Tomahawk, Alberta was shown by Stephani Pappas of Beaumont, Texas at the Calgary Stampede’s Canadian National Miniature Horse Show, a break from tradition as Whyte usually shows her. The mare, out of three-time world champion First Knights Lord of the Rings, continues to blaze brightly on the show circuit despite her age, Pappas added. While they may be small in stature — topping out at a maximum height of 34 inches — these steeds get the job done. Hunter/jumper, pleasure driving and obstacle were just some of the 83 classes that took place over four days of competition in the Northern Lights Arena and the Nutrien Western Event Centre. Once they’re hooked, it’s not uncommon for enthusiasts to build herds of the animal, which were originally bred to pull coal-loaded carts in the mines of England. Just ask Stephanie Gabrielson, who shares her family’s acreage east of Calgary with 15 miniature horses. So what do you do with all those minis? That’s easy, she says. “We love them,” says Gabrielson, 29, the third generation of her family who have had their heart completely captivated by the breed. Her grandmother showed, as do her mom, Tracy Rouleau, of Smoky Mountain Miniatures and her aunts. And Gabrielson is passing on that passion for miniature horses to her son James, who just turned four. Despite his tender age, 2018 marks James’s second time showing at the Stampede. He and his miniature horse, Circle J Escape from Alcatraz, competed in the Youth Costume Class. While his steed was done up as a dinosaur, James boasted a caveman costume that was assembled from one his mom wore when she competed as a four-year-old at the Stampede. She’s also sharing that passion for the breed with the next generation. Gabrielson runs the Western Canadian Miniature Horse Club’s youth program. She says it’s a “great honour” to foster youth development in the sport. Visit ag.calgarystampede.com/results for the full results from the Calgary Stampede Canadian National Miniature Horse Show.